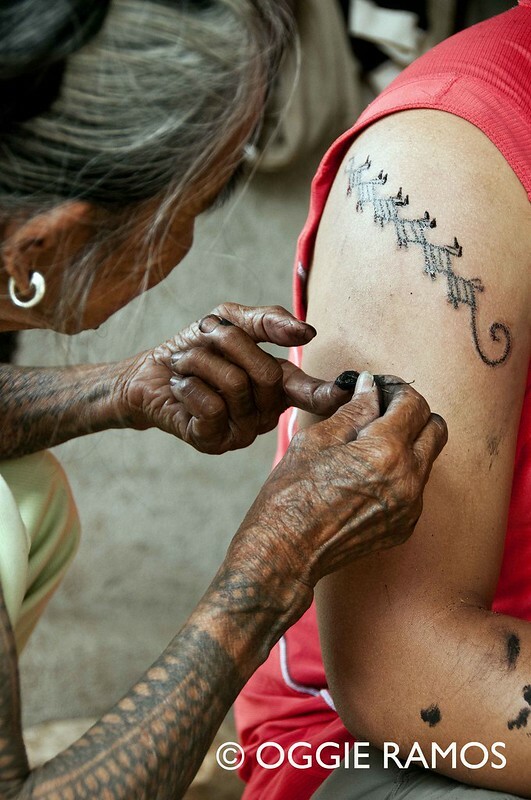 Would a 93-year old woman still have the clarity of vision and deftness of touch to create a tattoo? To find out, we hiked for over three hours from the barangay of Bugnay to the mountain village of Barangay Buscalan; elevation: give or take 3200-3300 feet above sea level (sorry, wasn't able to calibrate my watch properly after battery replacement); households: 126; voting population: 668. The jump-off point of our trek is Bugnay, famous (or infamous, depending on your perspective) as the birthplace of Macli-ing Dulag (see previous post for a bit of the backstory), the tribal chief who opposed the building of the large hydroelectric dam in Kalinga in the 1980s and paid dearly for it with his life. It's an almost 45-minute jeepney ride from Tinglayan to Bugnay and though I'm digressing from my topic, the ride bears mention. 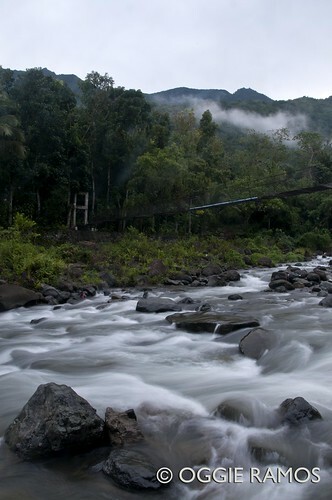 Contrary to being jaded after having seen quite a bit of the Ifugao scenery, I continue to be amazed by what I see here. The morning we set out, the weather was fair, an excellent excuse as any to go toploading (in local parlance, it means riding on top of a public utility vehicle), all the better to see the breathtaking sights -- mainly, the rambling Chico River as it meanders and snakes its way through the lush valleys, and the imposing Sleeping Beauty mountain range which reveals its more pronounced anthropomorphic silhouette the farther you wander southwest. The trek itself is scenic; huffing and puffing through lush hilly, undulating terrain and seeing only a few people along the way. It's one thing to see the topography from afar and another thing to actually hike through it, walking through paths obscured by creeping vegetation, smelling the sweet aroma of grasses, and occasionally sidestepping carabao poop. The few people we encounter on the trail more or less knows where we were headed. Arriving in Buscalan way past midday, we found an elderly woman crouched down, busy spreading out beans and peanuts on a sackcloth for drying under the sun -- Fang-od herself. After a quick lunch, it was on to the tattooing process. I distinctly remember Fang-od hauling a large spread of peanuts for storing before setting out looking for a wooden stick she can use as a hammer. She is incredibly strong and nimble for a woman (heck, for a man) of any age. There was an ongoing construction near her house so we opted to have the tattooing just outside the house of her niece, Abu, where we were staying for the night. It was my friend who was going to get a tattoo and I will be the one to document it. The makeshift tattoo shop seemed to me like a veritable tableau of local color -- pigs freely snorting around, friendly dogs wandering in and out of sight, curious locals nonchalantly passing by throughout the almost two hour process. Oft-written in internet sites and blogs, I wouldn't dwell on the process which I'd rather say is straightforward in description but painstaking in execution. Any which way you put it, it's amazing to see a 93-year old woman whose vision is sharp enough to create these detailed, symmetrical patterns; it's doubly amazing to see someone even half her age display the nimbleness and delicate touch to tap the kalamansi (local lime) thorn she uses to poke the skin with rhythmic regularity. All the while she dabbles in small talk with our guide, Francis Pa-in, who also acts as our interpreter. Her memory is still as sharp as her skills, remembering vivid details from the distant past. We ask her what's the most elaborate design she did. Her answer: tattooing a woman's upper body which took all of two sunrises and sunsets to complete. Was there ever a time she wasn't able to complete a tattoo? Answer: only once, when a foreigner had tattooing done on his legs, the pain proving too much he passed out. Oh, we wanted to keep asking her questions but I guess that's the beauty of having only a day to spare -- so we can hopefully come back and inundate her with more questions. Well, she is after all a living legend, a renowned Kalinga artisan. 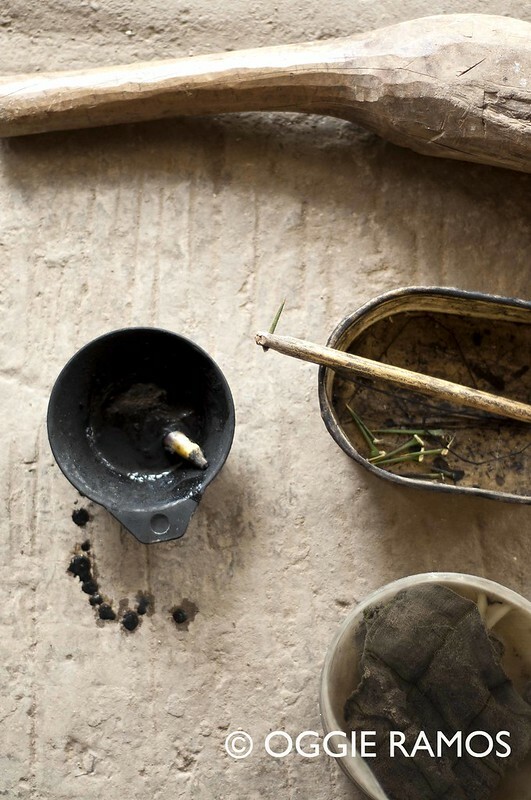 Her canvas is the human skin, her art the lingering mark of centuries-old traditions and beliefs. It's an art form she has picked up when she was 16 years old, in the 1930s. With a lot of the Kalingas Christianized and the old tribal beliefs and practices giving way to modernity, some would say the art is dying, with Fang-od the last of her kind. Having never married, she apparently had no successor as a mambabatok. That is, until seven years ago when one of her apos (granddaughter) through her niece, Abu, who one day had the inspiration to take up the art. Grace Palicas is that apo, a dusky 17 year old straddling tribal traditions and the modernities of the 21st century. We lucked out in arriving in Buscalan on a long weekend and finding her here, home from Bulanon where she is a freshman college student at Saint Mary's, majoring in AB English. What made her interested in picking up where her lola left off? 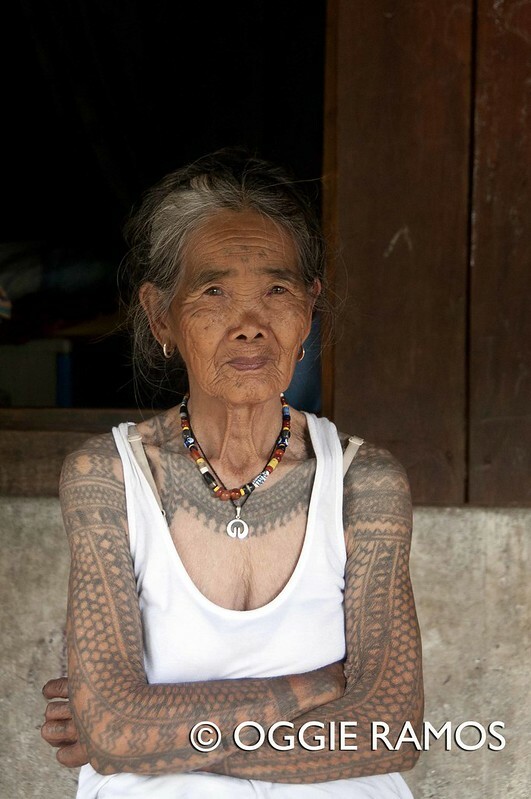 She shrugs, saying in Filipino that one day when she was 10, she just got interested in tattooing (I can only surmise she was piqued in seeing so many of the elders' tattoos). 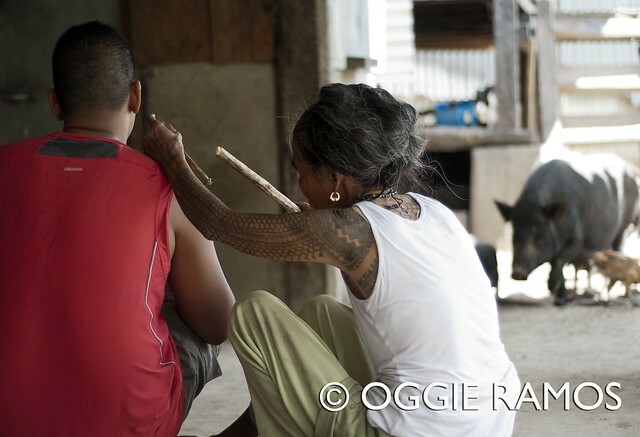 Grace does some of the tattooing of the visitors though not yet in the scale and intricacy of her lola. 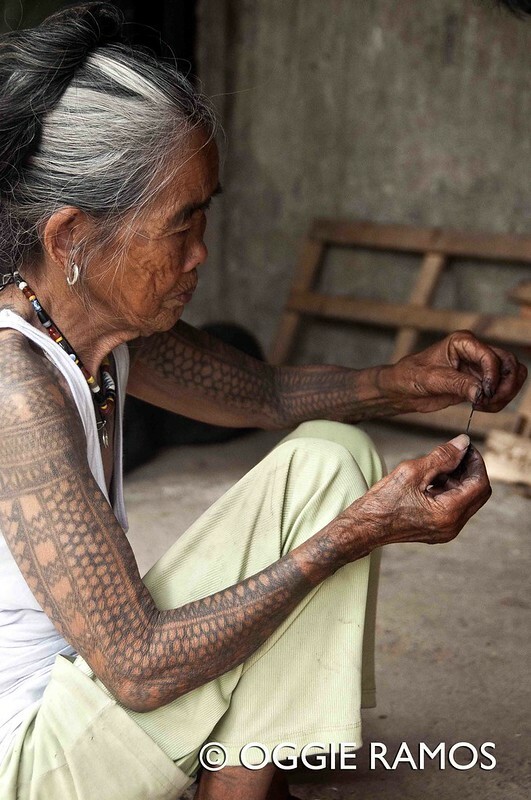 She, however, serves as an important bridge to the world outside Buscalan and Kalinga where she presents the tattooing art in the Dutdutan festival in Manila. Though far from frail, Fang-od almost never ventures outside Buscalan and Kalinga, feeling she might get sick from the pollution of the cities, our guide, Francis tells us. The morning after, we were trekking back to Tinglayan via a traverse of the mountains for Liyao near Luplupa, when we heard shouts. It was Grace, energetically catching up with us carrying my camera's remote shutter release which I left behind. Francis joked she needed the early morning exercise. She only smiled in response. Why do I get the feeling she will play a very important part in carrying the legacy of her lola? Tattooing: a historical perspective. In a generation far removed from being warriors, people nowadays get tattoos for reasons vastly different from people in the past. Today, it could be a mark of rebellion, self-expression, hipness or as can be gleaned from lingering perceptions, a sign of lawlessness and criminality. In olden times, Lane Wilcken, author of the book "Filipino Tattoos, Ancient to Modern", writes, "one has to possess the qualities the tattoos represented prior to wearing them. The internalization of these traits or in other words, the tattoing of a person's soul was so important to possess before becoming tattooed. Without it, the marks on the skin are only vain decoration. Those men in the past who were tattooed without earning them were shamefully compared to the halo lizard which is richly patterned yet flighty and cowardly." According to Lane, both men and women were tattooed -- "the women at puberty because of their innate power and connection to the ancestors through life-bearing. Men, in contrast, had to earn their tattoos." Talk about how vastly different the situation is now when one can get the kind of tattoo he/she wants, right down to the last detail, when he/she wants it. What kind of ink? In ancient times, "tattoos symbolize the animal representatives of his ancestral spirits that guided his path as well as the gift of fertility and prosperity his actions provided. As a man went through life, each time he saw his tattoos, he was reminded to conduct himself in accordance with the prestige he had earned." There are many motifs though as an example of a tattoo's spiritual significance, the inufu-ufug tattoo of the Kalinga which resembles honeycomb patterns are actually representative of the hexagonal weave of their baskets they call "miniminata" to mean "many eyes". "This may imply the eyes of many ancestors watching over a person or additional spiritual awareness due to the seeing eyes of ancestors." So where do you want your tattoo? In the past, the question of where you get tattooed is not a matter of personal choice or aesthetics; rather, it is of spiritual significance. Lane writes, "In general, the upper body (waist up) in many of our ancient cultural groups was associated with the earth world. A person's head was associated with the heavenly world as the seat of the soul. The lower body (waist down) was associated with the underworld and afterlife where our ancestors dwell." People would normally opt to get a tattoo on their arm (safe, easily obscured by clothing). Back in the day, what would this mean? According to Lane, "the hands were special members of the body because they symbolically traveled between the earth and the heavenly worlds (upper body) and the underworld (lower body) depending on the task they performed. For example, Kalinga male with the gulot or head-taker tattoo which is a series of lines tattooed around the wrist or hand showed that they had dispatched people from the world of the living to the afterlife. In the act of raising the head axe up and then driving home the beheading stroke, the hand and wrist symbolically travels the breadth of the three realms from the heavens, through the earth world, and down into the underworld." Epilogue. 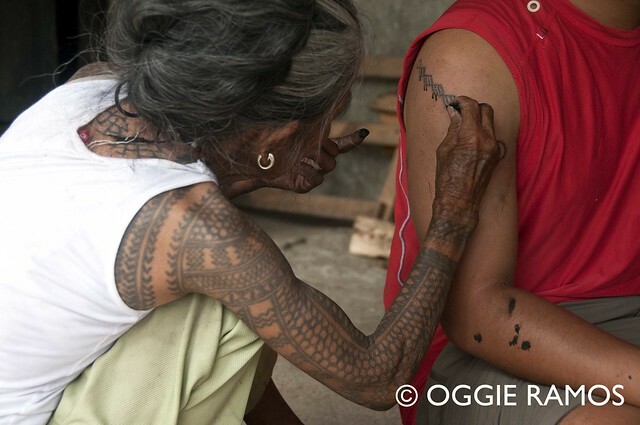 In our day and a half stay in Buscalan , my friend got his tattoo while I was content to watch and shoot the process. While my personal religious convictions kept me from giving in to repeated goading and cajoling, I am well aware of tattooing's spiritual significance. It's amazing that in the several villages where we hiked to on our traverse of the mountains leading to Liyao and back to Tinglayan, the locals were still very much animated in seeing my friend's new tattoo as if it wielded some kind of power. Goes to show that back in the day, tattooing, like deep-seated beliefs, is more than skin-deep. Directions: To get to Buscalan, take the jeepney headed for Bontoc from Tinglayan (8am and 1pm, 9am for the bus) and board off at Bugnay; jeepney fare: P20.